Moving time: 5 hr 4 min. Weather: 55°F (13°C) in the morning; got up to 80°F (27°C) by the end of the ride at 3:30 pm. Mostly cloudy. Colder and intermittent hail on top of Togwotee Pass. Joe, Randy, Chris and I got up this morning around 7:00am, had breakfast with the Martins, took some pictures of the cabin we stayed in, pictures of the Martins and us, and started up Togwotee Pass. It was a 2500 foot climb to the top of this, the second highest pass on the TransAm route at around 9600 feet. [Article written by Randy Fay after the trip about the Martin's Hostel: Staying at Aspen Meadows was a great and memorable pleasure. 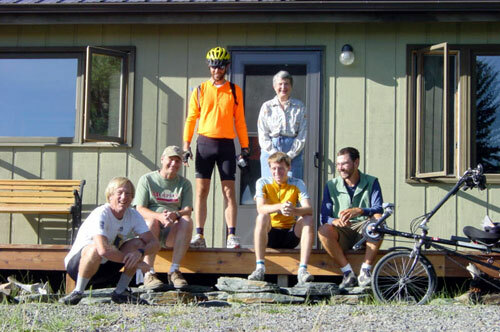 I was north from the Denver area with Christian Ruckstuhl (he heading for Calgary, I for Jasper) and we rode a couple of days in Wyoming with Joe Deely and Larry Flint, who were riding from Virginia on the Trans-Am. We rode from near Lander, WY to Dubois that July 19, a pretty good 75-mile uphill haul after a couple of days of traumatic weather. 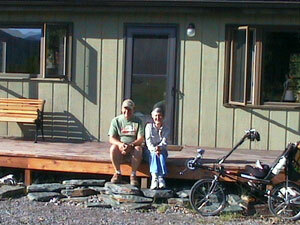 We made reservations with Dave and Joan and were amazed when we got to their wonderful place. They took us in and made us incredibly comfortable. We knew that the $15 was a great deal for a place to sleep inside for a night (we had been two nights in men's rooms because of incredible storms :-), but were unprepared for their hospitality. They gave us a place to sleep, but then proceeded to feed us wonderfully, provided wine, beer, and great conversation, took our clothes and washed them, welcomed us into their one bathroom to take a whole set of glorious warm showers. By the time we left in the morning (after a delightful breakfast) we felt like old time members of the family. It was a rare treat. And then Dave and Joan kept up with us through the summer and the fall, following Larry's web site for his progress and emailing the rest of us to keep in touch. Wonderful people, and a great place to stay. We gave out their cards all the way north to Missoula.] This picture was taken by Randy although I have one that's the same (only granier). The ride down the pass was fast and fun. We did have some hail and cool weather at the top and then a little bit of rain when we reached camp. 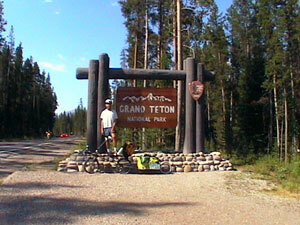 Randy left our group today to head toward Jackson, Wyoming on his journey. Now it is just Joe, Chris and me. 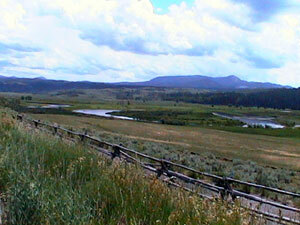 You can see the Tetons in the distance in this picture. 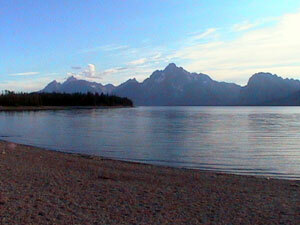 The Grand Teton is a wonderful national park, much like the others here in the west. The traffic wasn't as bad as I was expecting for a summer weekend. 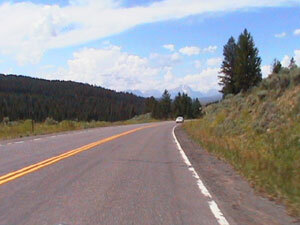 The roads lack shoulders in the park which makes riding tricky with all the RVs. I took some video of a moose munching on leaves just inside the Moran entrance to the park. 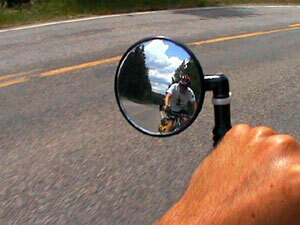 Here are some neat shots of Randy in my rear view mirror and my riding partners ahead of me. It was nice not having a headwind for a change today. Yesterday really beat me up with that 20 mph headwind just pounding at my chest. 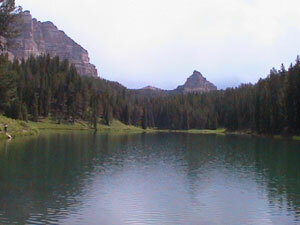 Here are a few other shots taken in and around the park. I met up with seven other riders today. 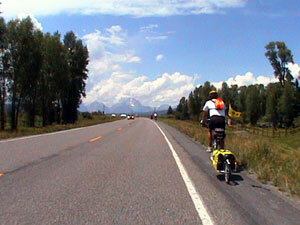 Five were southbound Continental Divide riders who were coming down Togwotee Pass as we were going up. They seem to be having the time of their lives - I should do the CD. Danny Stoneham, is an eastbounder from Pennsylvania who has a broken shifter and is limping his way to Dubois for repairs tomorrow. The seventh is a guy we saw on day 36. It turns out that he has had the exact itinerary that we have had for the past seven days but we just never saw each other. It happens! 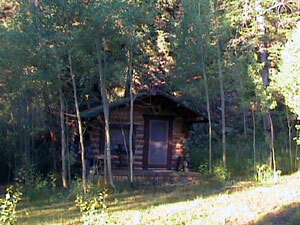 The campgrounds here are very nice. They have picnic tables, nearby bathrooms with running water, and bearproof boxes. About a half mile away is a Native American art and history museum, a grocery store, pay phones, an outdoors store with camping gear, a souvenir shop, and a marina. There is also a place to go on the Internet and hook up a laptop but the connection was poor so I couldn't update this site. 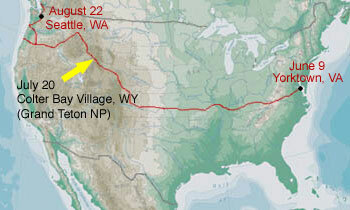 I'm on to Yellowstone National Park tomorrow and Montana the day after. I'm meeting Pat Pierre and Kelly Yeagle, two close college friends in West Yellowstone on Monday and am really looking forward to it!